National Signing Day and is Texas MBB just in for another bad offensive season? It’s still the early part of the season which means teams are still sorting out lineups and figuring out which groups of players meshes best. You don’t want to get too bogged down with early season results, but in some cases, it’s probably not a bad idea to raise a few red flags ... looking at you Texas. Jordyn Oliver to Baylor, Will Baker to Texas, Tyrese Maxey to Kentucky and Nyah Green to Louisville. Plenty high school stars signed during the early signing period Wednesday morning. Big winners are perhaps the flagship programs in men’s basketball with Texas officially inking Westlake’s four-star big Baker as well as Fort Bend Elkins’ four-star guard Donovan Williams. Texas A&M locked up Maxey’s backcourt mate at South Garland, Chris Harris Jr., Tyreek Smith out of Cedar Hill Christian and Sahvir Wheeler out of Houston Christian. The Aggies also locked up Kobe Brown, a three-star out-of-state recruit, making them perhaps the standout of the day. The headline in girls basketball was likely five-star Bishop Lynch guard Endyia Rogers signing with USC. She committed to the Trojans earlier in the week over Texas, Tennessee, Ohio State and Mississippi State. Same old story with Texas? The Longhorns are 3-0, but it doesn't feel all that good. First, the Longhorns pulled out an ugly win over Arkansas in Fort Bliss. But to their credit, there's something to be said about eeking out a win even after shooting an abysmal 31 percent from the floor. But to do it against UL Monroe a week later, a middle-of-the-pack Sun Belt team? Granted, Texas finally put the clamps down on the Warhawks and exploded on a 15-0 run in the second half that eventually put the game away, but three games into the season and the Longhorns aren't even shooting 30 percent from 3-point range. What has been the problem for the past few seasons seems to still be a problem. In a season that might have Shaka Smart on the hot seat, is it time to be worried about Texas seemingly being the exact same team it's been over the last few seasons since his arrival? Monday night the Lady Bears were put on upset alert by the Sun Devils, but still came away with a 65-59 victory in Tempe. At one point, Arizona State led by as many as 14 in the second period and at one point, were 5-of-11 from 3-point land. That combined by senior center Kalani Brown getting into foul trouble and only playing in the opening quarter spelled trouble for Baylor. Brown played 17 of her 22 total minutes in the second half and finished with 14 points and seven boards. Thursday night, Baylor rebounded comfortably with a dominating 94-49 win over Southern. 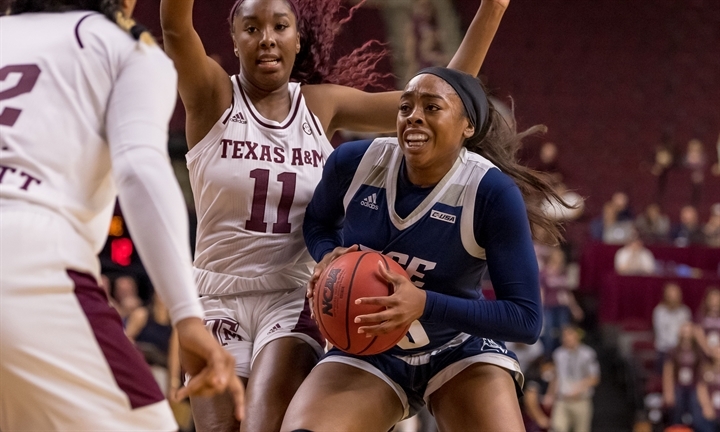 WBB: Rice at Little Rock Saturday at 2 p.m.
Rice is still looking for its first win, but both of the Owls' losses aren't bad blemishes to have on the resume. One was an 11-point season-opening loss at No. 20 Texas A&M and the other was a nine-point loss at No. 23 UCLA. Senior guard Erica Ogwumike has struggled to find her scoring touch (6-of-22 from the floor so far) and Oklahoma transfer center Nancy Mulkey has yet to make her debut due to an injury. The latter is more of an issue than the former with Ogwumike being a proven player over the course of her career and Mulkey's addition was expected to push Rice to the top of Conference USA. Little Rock (2-0) is a perennial contender in the Sun Belt and are the preseason conference favorites. The Trojans led by Preseason Player of the Year Ronjanae DeGray averaging 13 points and seven boards per game. It's not panic time for the Owls, especially if we've yet to see the team with Mulkey, but a potential 0-3 start is possible with Texas Southern and the talented Marquia Turner on the horizon following this weekend. MBB: Texas Tech at USC Monday at 8:30 p.m.
Chris Beard and the Red Raiders (3-0) head to Los Angeles for their first big test of the season. According to Kenpom, Tech is playing like a Top 25 team to start the season posting a Top 4 defense in terms of opponent offensive rating allowed. Now, the competition hasn't exactly been grueling with a poor Southeastern Louisiana team probably being the best of the bunch so far which is what makes Monday night's matchup more interesting. Also something to watch is how sophomore Jarrett Culver faces his first true challenge as the primary playmaker and scorer for the Red Raiders against a quality program. So far, Culver's averaging 16 points and four assists per game.